Erik Paulsen visits Diversified Plastics, Inc. as part of a tax reform listening tour to small businesses Diversified Plastics, Inc.
MINNEAPOLIS—Congressman Erik Paulsen (MN-03) recently visited Diversified Plastics, Inc., a custom plastic-injection molder of high-precision thermoplastic components, as part of a small-business tax reform listening tour. The objective of the visit was to learn firsthand how tax reform can help Minnesota businesses and families. An employee stock ownership plan (ESOP) company, Diversified Plastics offered unique insight on tax reform. 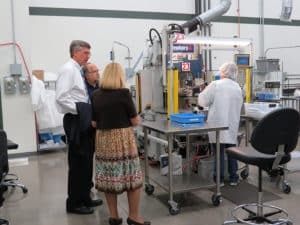 Annette Lund, vice president of Diversified Plastics, led Paulsen and others on a tour of the company’s facility where they had an opportunity to speak with employee-owners. 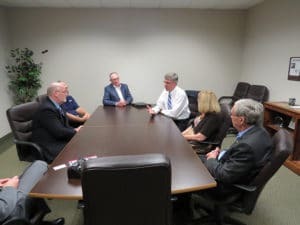 A supporter of ESOP companies, the congressman was referred to Diversified Plastics by North Hennepin Area Chamber of Commerce. Videos from the visit are available on the Diversified Plastics, Inc. website at www.divplast.com.